The cosmetics industry has been overtaken by a disturbing phenomenon where innovation is replaced by imitation. It’s easier to copy the competition’s successes than risk launching an innovative new product that might not produce guaranteed sales. More disturbing…the industry has moved from product imitation to literal DUPLICATION. All cosmetic companies work with external manufacturers to produce a percentage of their products (some more, some less). These manufacturers create new and innovative formulas and packaging to entice cosmetic companies to work with them. It’s normal for the same concept/formulation to be sold to multiple brands. Most premium cosmetic pencils are produced by one of two European manufacturers. Example: The difference between MUFE Aqua Liners, Urban Decay 24/7 and Smashbox Timeless waterproof pencils – NOTHING (except the exterior of the pencil). Don’t be shocked, it’s pretty much standard practice in the cosmetic industry. Each cosmetic company chooses different product colors and exterior packaging so they won’t all look alike …even though the guts (formulation) of the actual pencil might be the same. BUT what happens when the exterior packaging IS the innovation? And the innovation is VERY distinctive looking? 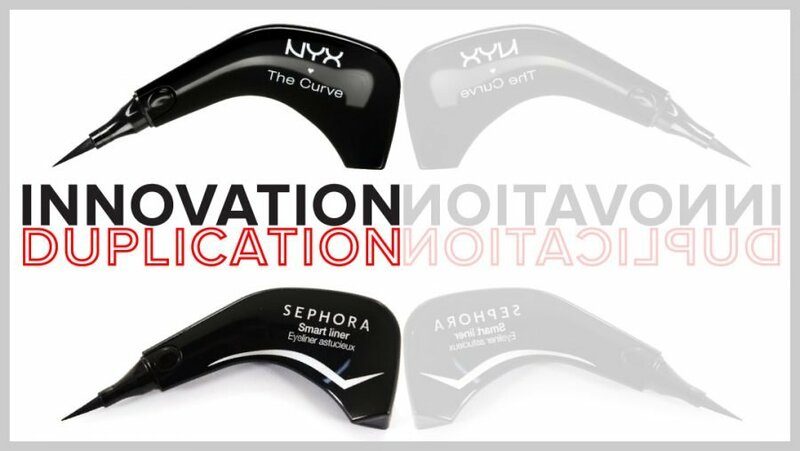 Innovation NYX Cosmetics The Curve (they launched it first). Applying liquid eyeliner to create that perfect “wing” seems to generate terror in a lot of women. Skillful, steady hands begin to shake and curse words fill the air. 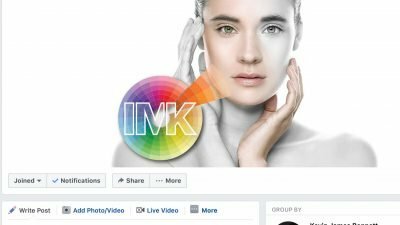 Those smart folks at NYX Cosmetics sourced this innovative application system from a VERY famous cosmetic manufacturing company in Germany. The thoughtfully designed component addresses liquid liner phobia with a clever ergonomic shape, making application almost mistake-proof. The Curve ($15 USD) features a grip zone providing just the right hold for a precise and secure application. Even the klutziest hands stand a better than average chance of conquering their liquid eyeliner neurosis with this applicator. I’d qualify that as a stroke of genius (sorry about the pun). Well, obviously Sephora agrees because they went directly to the same manufacturer and printed their name on the same component – not a similar component – the identical component. Allow me to introduce you to the Sephora Collection‘s copycat of The Curve – Smart Liner ($14 USD). Why would Sephora slap their name on an exact duplicate, after it had been launched by NYX, a highly visible global cosmetic company, a year previously? Obviously, this is from the same manufacturer. At least, the nice folks at Pierre Rene Professional opted for “originality”, and choose a different color exterior. I hope this exposè hasn’t damaged your perception of the magical, mystical world of cosmetics (too much). I DO hope it’s made you a smarter and more aware consumer. UPDATE: Sephora has discontinued the “Smart Liner”. “The Curve” is still available from NYX Cosmetics. ©2013 Makeup Art + Design Enterprises – all rights reserved. The #MyTwoCents Blog is informational only and not a substitute for professional advice. Product(s) featured in posts were purchased unless otherwise noted. ALL reviews are unsponsored, and product links are NOT MONETIZED (no affiliate links). Outgoing links are directed to reference sources and trusted retailers. Click the star (above left) for more Legal information. Do you know the names of the European manufacturer ? I believe it was Schwan-STABILO…but I’m not positive. This why you’re the king of info Kevin I already knew this but its horrible to know that the level of innovation that exists in this industry is at a all time low. Seriously come on! That blows me away!! What are the two big europeancompanies!? How does that even work!? Do you have a list compiled of the same formulas packaged by the different companies? I would lobe to know what I can get for cheaper to restock my kit. I took the last year and a half off from pregnancy and having my baby and I need foundations. Sorry Jenn, I don’t have that kind of list. I own the Sephora one and I quite like it, very pigmented and precise and very easy to get that veeeeery fine line that I need. But the minute I saw it “Copycat” is exactly what came to mind. Maybe they are trying to offer every possible type of makeup product. They do have loyal customers, so why not adapt their makeup line to their growing needs? It looks like the cosmetic companies have learned from the Drug Companies. Btw – Since I have found this site, I have been hooked. I am starting a donation only make-up group for women over 50. We attend a 12 step meeting in L.A.and once I handed the private flyer out, the group is now positively packed. Thank you for the inspiration, Kevin. I’ll let you know how it works out. Kevin, Do you know why you are the only make-up artist I call my guru (I am not one to sit in front of hours of YouTube)? Because you tell it like it is, you aren’t afraid of the powers that be and you SHARE YOUR KNOWLEDGE! I don’t know what makes so many make-up artists think that if they tell you their secrets it somehow diminishes them, but I’m constantly “spilling the beans” to other make-up artists and to clients and I’ve never felt lessened for it. And, oh yeah, because you’re my friend and I think you’re a genuine person in a false world. Never change, sweetie. The truly shocking thing about this article is that the NYX version is $15 and the Sephora is $14! Holy cow. When did NYX get more expensive than Sephora? Well, I’m not sure what the law says, but; maybe NYX doesn’t have exclusive rights to the design of The Curve. In this competitive industry what protects companies from copycats? Apparently, this ruthless version of capitalism is allowed! As a consumer, I have choices–in this case, I can save a dollar. Thanks Kevin, this is very informative! Actually, Schwan-Stabilo does offer exclusivity …for a limited time. MUFE had the exclusive on the Aqua pencils for the first year. Then Urban Decay, Smashbox and just about every other major cosmetic company introduced “their” version (same manufacturer, different colors, different exterior packaging). Cosmetic regulations in Europe are often updated to follow the trends of innovations and new technologies while ensuring product safety . For instance, all annexes of the Directive 76/768/EEC were aimed to address potential risks to human health . The new and latest EU Cosmetic Regulation 1223/2009 will take full effect in July 2013. Under this new regulation, manufacturers, retailers and importers of cosmetics in Europe will be designated as “Responsible Person”. We’ll update you with the latest cosmetic news, product reviews, and makeup tutorials. ©2019 Makeup Art + Design Enterprises - all rights reserved.